The New Project window lets you create a new project. If a project is already open and you want to create a new one, use the File menu. Note that the content of the project directory will appear when you save the project for the first time. Press Ctrl+N (Windows) or ⌘+N (Mac OS X). The name of the storyboard project. This name will appear as the file name. The location of your new project. Project Title The name of the project. It is a good idea to use the same name for the project name and project title. The titles that will appear on the appropriate pages of PDF exports. Displays a list of resolutions for you to choose from for your project. 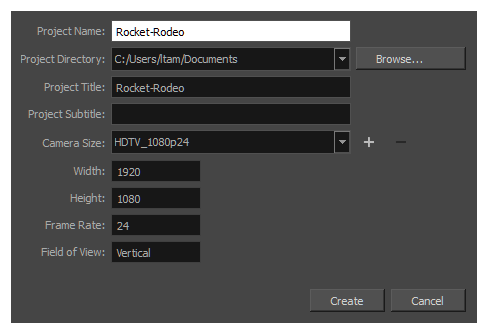 The parameters of the resolution you chose from the Camera Size menu. Note that you cannot change these parameters. Opens the New Resolution window from which you can create a custom resolution—see Creating Custom Resolutions. Removes a custom resolution from the Camera Size menu.